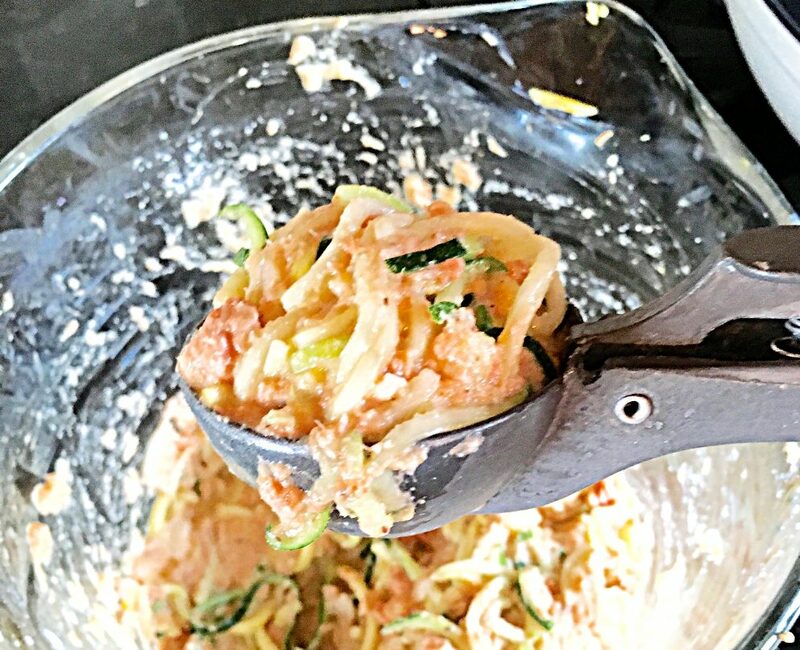 Before we say goodbye to the Pacific Northwest growing season, we must pay homage to the most prolific garden vegetable ever, the infamous zucchini. 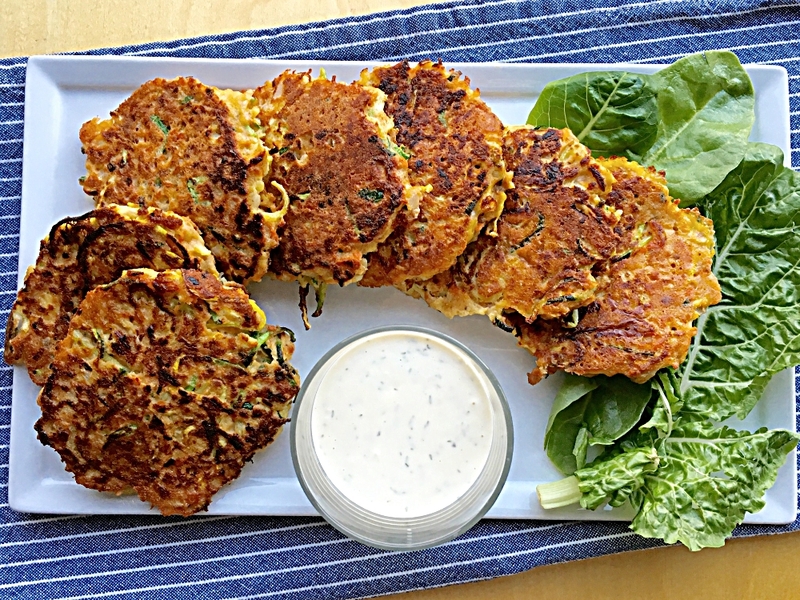 Whatever your plans are for this holiday weekend, you’ve got to make these savory cakes . 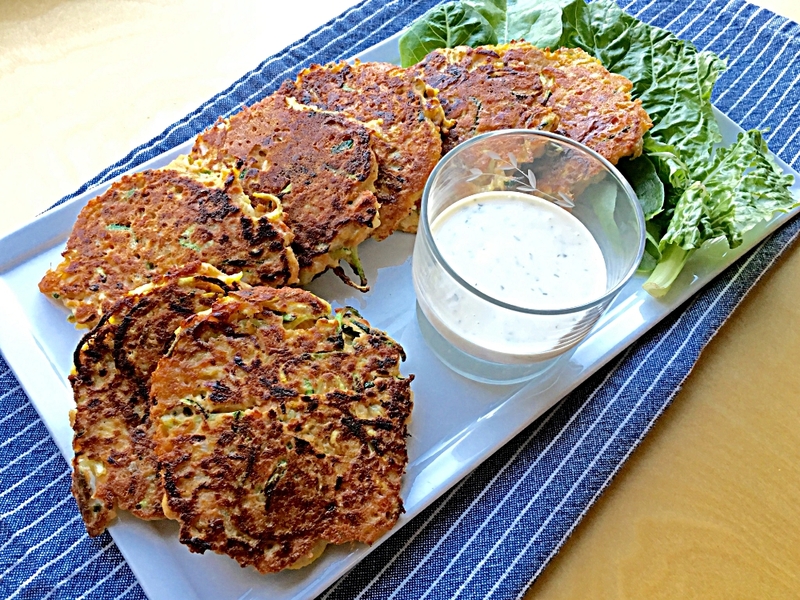 These grain free, dairy free Pan Seared Zucchini Salmon Cakes can be served for breakfast, brunch or dinner. 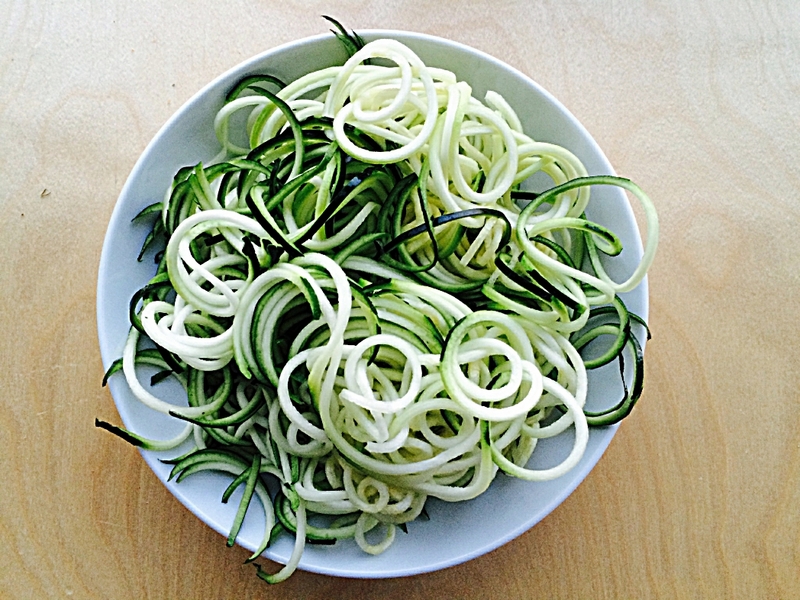 Start out with 2 cups of well packed zucchini noodles. You’ll want to trim them so they are easier to make into patties later. Add 1 – 6 ounce can of wild sockeye salmon (drained) and mix well so the salmon is well-distributed. This is an easy recipe that comes together in a jiffy. Once the batter is prepared, I use an ice cream scoop (3 tablespoon capacity) to plop heaping spoonfuls into an oiled preheated skillet. Press mounds to form patties. Mix together the simple sauce while they cook, make a salad and slice some melon. There you have an amazing healthy meal. These are knock-out delicious. Please make and tell. 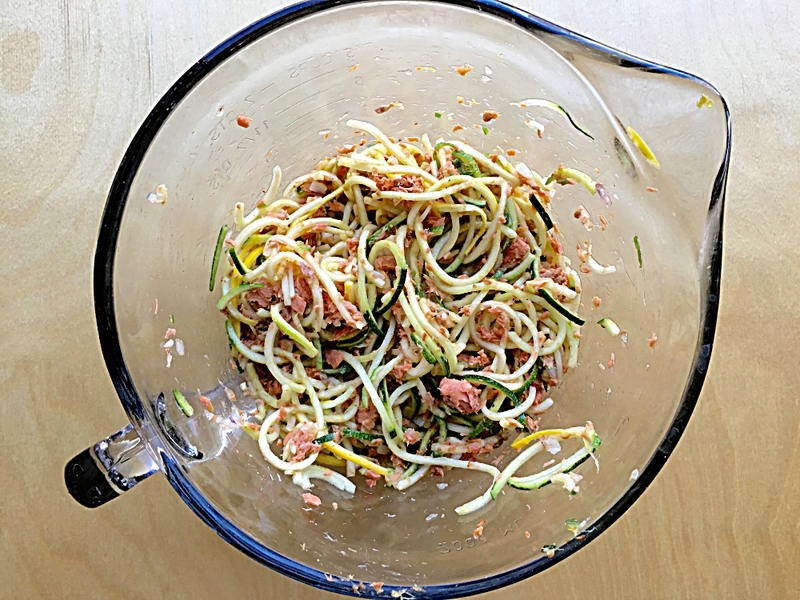 In a large bowl, combine the trimmed zucchini noodles and drained salmon, making sure the salmon is well-distributed. Add the jalapeno, onion, lemon zest, spices, sea salt arrowroot and almond flour. Mix well. In a small bowl beat 2 eggs and add to salmon mixture. Mix well. Heat 2 tablespoons of avocado oil in a shallow skillet. When oil is heated, add batter in heaping spoonfuls to the skillet. Press mounds to form 3-4 inch cakes. Cook on medium high heat for 4 minutes on each side. Mix all sauce ingredients together in a small bowl. Adjust seasonings to taste. Serve these delicious patties and sauce for brunch or dinner, add your favorite breakfast protein (bacon? ), a green salad and fresh fruit. Just made this for Labor Day. It’s delicious Amy! Amy, would coconut flour work for this instead of almond flour? I haven’t tried coconut flour but I think it could work Debbie.